Clara Kelley is an Irish immigrant mistaken for another Clara Kelley when she gets off the boat in America. 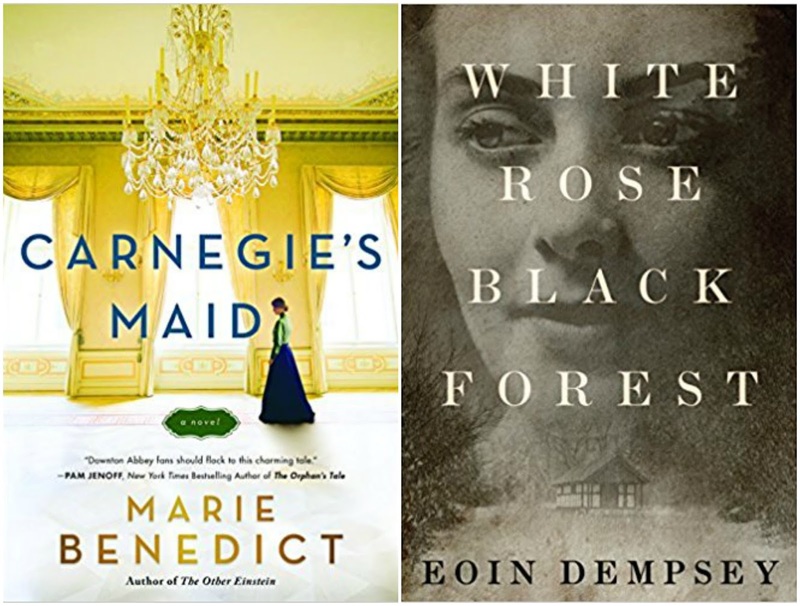 Under the guise of her mistaken identity, she goes to work in one of Pittsburgh's grandest households for the Carnegie family. It's a sure job and she wants to send money home to her family. Slowly she develops a relationship with Andrew Carnegie at the risk of him finding out the truth about her. I started reading this at the end of last month and finished it early this month. Clara was an interesting character, very set in her ways. I loved reading about the contrasting lives of the different social classes during that time and the effects of the industrial era on life. 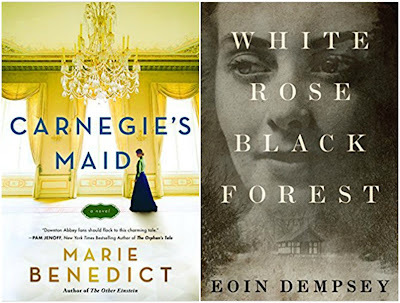 Overall, I really liked it as a historical fiction book. This book is set during WWII in rural Germany. The main character Franka is staying at her family's summer cottage when she discovers an unconscious airman in the snow in the middle of the forest near her cottage. She takes him to the cottage and begins to unravel his identity. They begin to trust each other to reveal things about their past. This really held my attention. The setting and plot were well done and I really liked the characters. Sausage Breakfast Casserole- My husband brought home some vegetarian sausage from work and so I was looking for something to make with it. This recipe came up in a search and it was delicious! The sausage didn't have maple flavoring like the recipe called for, but I added about 1/4c. of maple syrup to it and it was delicious! Zucchini Muffins- We have so much apricot butter from our tree that we are trying to use. I've made quite a few things, mostly bread. I found this recipe and used it to make muffins. We added a cinnamon and sugar mix on top and the whole family loved it! I will say that this recipe makes about double what it says. Slow Cooker Chicken and Corn Chowder- This looked like an easy crockpot meal so I made it when I had to stay late at parent teacher conferences. It was just ok. I didn't find it as flavorful and eating all the leftovers almost felt like a chore. I would recommend some garlic seasoning in the soup and shredded cheese on top! Mexican Spaghetti Squash Boats- I've actually never tried to make anything with spaghetti squash and wanted to give it a shot. My husband was quietly skeptical. He had the hot sauce and was prepared to douse the taste of it with spiciness. Imagine his surprise when he took a bite and actually liked it! It was pretty funny. I will be making spaghetti squash again and already have a few recipes I've pinned that I would like to try. Crack Chicken Noodle Soup- This was delicious soup that was easy to make and a hit with the whole family. The bacon in it certainly didn't hurt either! 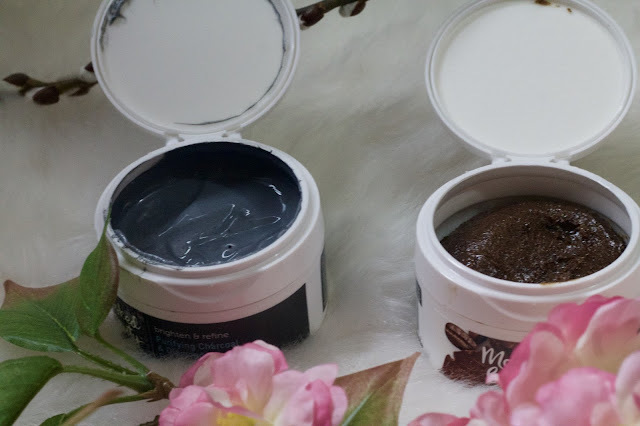 I was recently sent two Masked Beauty masks through Brandbacker to try. I love doing masks and try to do one a few times a week. I always feel like my skin looks more refreshed and rejuvenated. 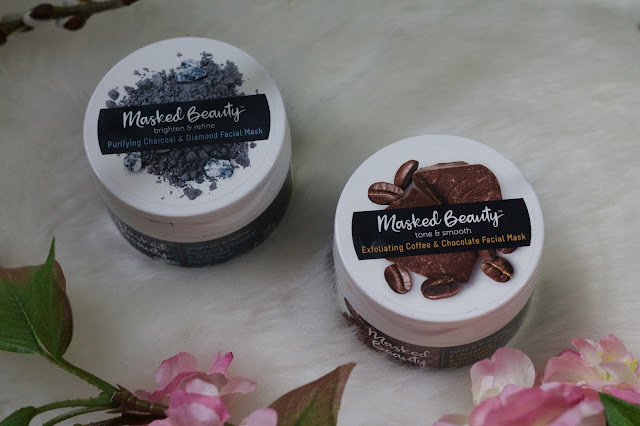 I was sent the Purifying Charcoal Mask and Exfoliating Coffee & Chocolate Mask. I also received an angled Silicone Facial Mask brush that fits the facial contours for an even and easy application of the masks. I typically use my fingers for application of masks like these, but the brush worked much better and provided a more even application. 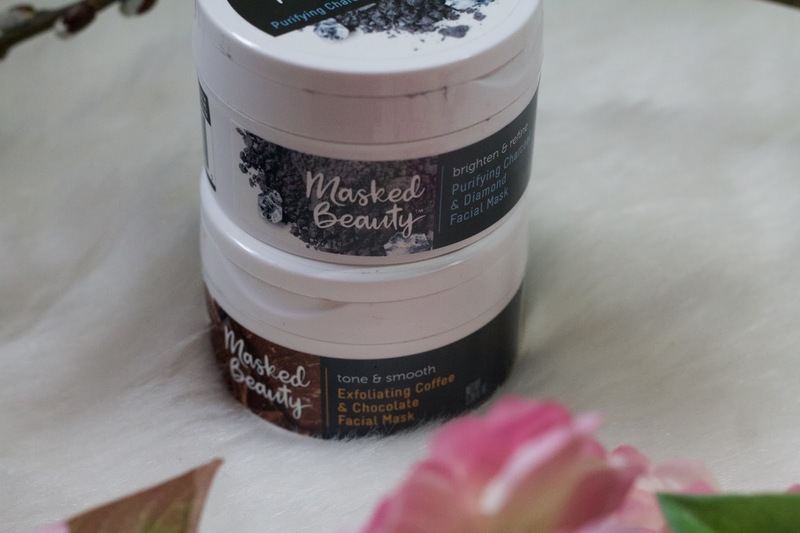 The Purifying Charcoal is meant for refining pores and the Exfoliating Coffee & Chocolate Mask to help with skin tone. 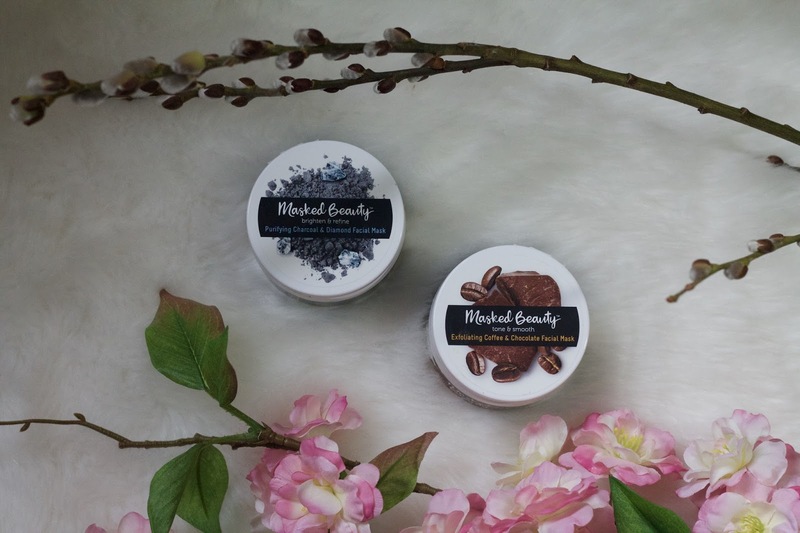 Masked Beauty also makes four other masks for other skin issues including Toning Red Clay, Overnight Pistachio, Moisturizing Ginkgo & Oat, and Soothing Rose & Peony. These masks are available at stores like Safeway, Albertsons, Meijer, Hy-Vee, and Jewel-Osco. Masked Beauty products are never formulated with any Parabens, Phthalates, Formaldehyde, Triclosan, Polyethylene Microbeads, Bisphenol A (BPA), and Toluene. The ingredients they do contain are high performance like Pure Kaolin, Sweet Almond Oil, Shea Butter, Ginkgo Biloba Extract, Beeswax, Caffeine, and Flower Extracts. You can see, feel, and smell the ingredients just opening the container! Both masks I tried smell amazing. The charcoal mask has a lovely, clean smell and went on smoothly. The coffee & chocolate mask contains real coffee grounds to help with exfoliation. Gently massage face mask into the skin as needed. Allow the face mask to sit for 5-10 minutes. Using warm water, lather and rinse off thoroughly. They are very easy to rinse off. Unlike other masks I have they stay moist and do not dry out on your skin. The masks are in easy to open containers and contain a lot so for the price of $7.99 you get a lot for your money. My skin looked and felt better after using each of these masks. You can enter for a chance to win a box of fan favorite goodies including some Masked Beauty masks below! Currently showering- Hmm. The only thing I can think of for this one is my daughter has been loving showers lately (and I love them too because they are easier and faster). Some of the items that she enjoys in the shower are this United States map, these shower gel crayons, these bath paints, and this alphabet set. Currently cultivating-Nothing really. It's too cold here for gardening. And I'm just battling to keep my houseplants alive! I'm looking forward to planting basil soon though. I love adding fresh basil to recipes in the summer! Currently expecting- Spring to come any day now! Our tulips are just beginning to pop up. I can't wait for them to bloom. They are always so pretty and make it feel more like spring. Currently making-Claire and I have made some fun new crafts with our Cricut. We did Easter placemats and matching shirts for Claire and Aveline for Easter (top photo). We have so much fun crafting together! Currently buying- Matt and I are hoping to buy a new house sometime this year so we have been keeping an eye out. We will have been in our current home for 9 years this year and while we still love it, space is starting to get a little tight in places. It will be hard to leave it though. We've done a lot of work on it and made so many amazing memories! I think it will be a tough sell to find a new home, especially for me since I am such a sentimental buyer! Currently everything else- Aveline just started rolling both tummy to back and back to tummy last week. She's been trying so hard to sit up so I don't think it will be much longer before she does that, too. She's such a happy baby! Claire just got a pair of tie tennis shoes that we have been working on teaching her to tie. When did you teach your kids to tie their shoes? She's been reading on her own so much. I've been wanting to get her a simple chapter book, too. Possibly a part of a series. Any recommendations? Hope your March was wonderful Happy Easter everyone! Those beautiful girls! Isn't it amazing how much changes in a year?! So glad you have that beautiful baby. You are one busy and blessed lady, best wishes on the house hunt! Yes, Spring can come anyway! The masked beauty sounds great! Your girlies are so precious and sweet!! I am sentiment l to and had a hard time letting go of our old house but it will be so worth it and you will make so many more precious memories with the girls growing up. Happy Easter beautiful! Oh those masks sound lovely! I need a brush like that, I do masks with my fingers too but they are always uneven, haha! Good luck with the shoe lace tying, I know we will need to think about that soon but we haven't yet. i remember having 'practice' laces to tie as a kid, no idea if they even still make them, but I'd look out for that! Just cardboard you thread laces through. Ooh, fun update! Loved your AZ pics on Instagram today, so I hope you are having a great trip! I think my kids learned to tie their shoes around Kindergarten. They practiced a bit in preschool, but in K the teachers started asking parents to work on it at home because it was just too much for them to be constantly re-tying the shoes of all the kids in their class! I also got to try these mask out. The brush was so nice to use to put them on. Hope you are having a great time in AZ. I need to try the Mexican Spaghetti Squash Boats recipe! I'm glad it has some flavor to it! Those face masks look good and you get a lot in one jar! Enjoy your time in Arizona! I love spaghetti squash. Mexican spaghetti squash sounds great. I had to laugh about your husband's reaction to the spaghetti squash because mine was the exact same, and he liked it too! That recipe looks really good, I'll have to check it out. I love that picture of your girls--they're adorable in their matching shirts! We haven't started any easy reader chapter books yet, but I get a ton of great kids book recommendations from the blog Everyday Reading--I bet she has some good ideas. I must admit that I don't know how you do so much in the month, Laura!!! I must be uber lazy because not only do you work, blog, mother and cook, you also have time to read books? Totally amazing!! Great update dear! Your girls are sooo adorable, they have this contagious smile! Also, those masks looks really intriguing. I love to try those. I need to try those masks, I have been looking for new ones! Your girls are so adorable and I love the pictures! I love that you booked your trip last year in celebration. So special! there is something about going through infertility that leaves a lasting gratitude. We love spaghetti squash in our house. Nice recap my dear!!! Your girls are amazing!!!! My mouth is watering at the zucchini muffins. Your daughters are beautiful...there is nothing better than having daughters. I have three and they are grown now, but we are still very close and the biggest blessings of my life! Thanks for all your great recommendations! Good luck with finding a house! Oh my goodness, your girls are so cute!!! And I'm with ya... ready for spring to come and STAY! Apricot butter sounds divine! I'd love to try some of that! Oh my goodness Laura, the photo of the girls is amazing!! So beautiful! Thank you for those book suggestions, I need to pick up a new book this week. How bittersweet to love your home but have a need to look for a different one! Hopefully by now you are enjoying some warmer weather! 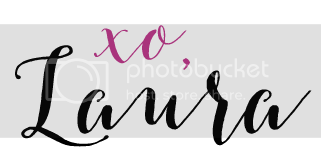 Enjoyed your post and looking forward to the May link up!